The end of the 2017 NFL season is almost upon us, with just one final game on the horizon and everything on the line between the New England Patriots and the Philadelphia Eagles. 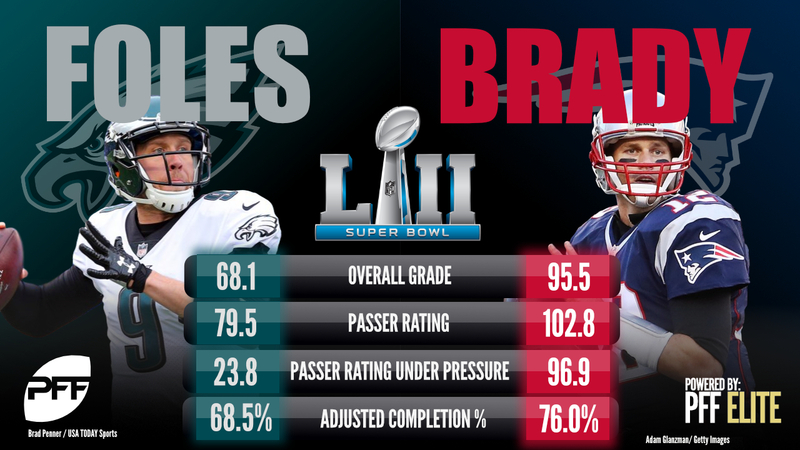 Super Bowl LII is the tale of two quarterbacks, not because Nick Foles and Tom Brady are directly comparable in many ways, but because they may each hold the key to their side of the ball in different ways. Let’s take a look at each player in turn and examine why they are they focal point when on offense, going beyond the obvious fact that they play the most important position in football. Quarterbacks can achieve their PFF grades through very different styles in play. Some players will give you a very consistent baseline of grading and performance, while others will be far more inconsistent, or high-variance in their output. Nick Foles may be the single most high variance quarterback in the game. His performance in the NFC championship game was genuinely remarkable. It was the fifth-highest grade we have given any quarterback in the playoffs (including Super Bowls) over the past 12 years of grading (plus a few bonus, one-off Super Bowl games graded). Foles was so good in that game that he wasn’t downgraded – at all – throughout the game. I’m sure that has happened before, but as one of the longest-standing graders at PFF, I can’t remember the last time I didn’t downgrade a passer over a game. He was actually pressured 11 times in that game by the Vikings, but you wouldn’t have known it, because his passer rating on those plays was 152.1, and he threw two deep touchdowns. His overall PFF grade for that game was 92.9, but it came on the back of three-straight games with grades under 50.0, including a 34.2 against Oakland in Week 16. 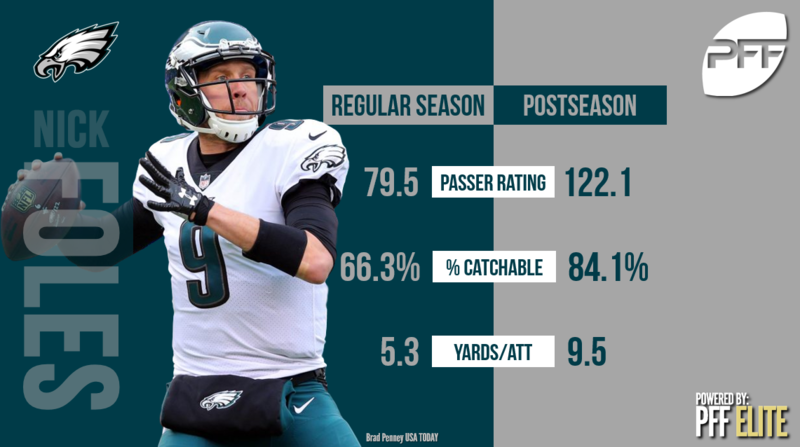 Whatever happens this season, we are dealing with some very small sample sizes for Foles as the Super Bowl will mark just his sixth start this season after replacing an injured Carson Wentz against the Rams back in Week 14. Foles however, has another very interesting year of data to work with, from back in 2013, where he posted some eye-popping numbers in Chip Kelly’s offense as it took the NFL by storm before the league caught up with it. 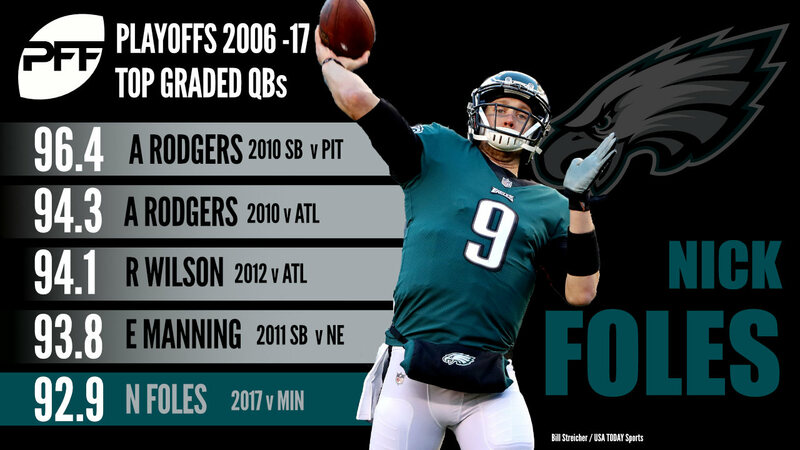 Foles threw 27 touchdowns that season to just two interceptions, with another two scores and no picks in his lone playoff game. Including that game, his passer rating on the year was 117.9, and he had a career-high in overall PFF grade at 80.9, more than 7.0 grading points higher than any other year. That’s a pretty good mark, certainly compared with his career average, but an 80.9 would only have ranked 17th this season, one spot above Dak Prescott, and that’s what makes that season so interesting. Chip Kelly’s offense – like Doug Pederson’s this year – was very good at manufacturing relatively easy yardage for his quarterbacks, or simplifying what they asked of them. The scheme this season was a big part of the success enjoyed by Wentz, and a big reason the Eagles offense can still function under Foles, and it makes that 2013 season arguably the most relevant in his career, despite it being several years in the rear-view mirror. Back in 2013, Foles did the same trick. He followed up the worst game of his career (a 31.6 overall grade against the Cowboys) with the best until he surpassed it last week – a 91.3 grade that featured seven touchown passes. Foles may be the biggest X-factor in this entire game, because his performance could land literally anywhere on the quarterbacking spectrum, from totally unworkable, to good enough to raise almost any side to victory, and I’m not sure there’s any solid way of predicting where in that range he will fall. As much as people want to talk up all the scheming that a Bill Belichick team and defense can do with two weeks to prepare for an opponent, the same holds true for Pederson’s Eagles, who were able to carve up the league’s No. 1 defense last week – a unit that had been historically great on third down – like it was a junior varsity team in their first practice of the spring. We hear all too often about the blueprint being set to beat a particular team, but there is a clear pathway to slowing down Brady and the New England Patriots offense. The problem is that not many teams are even close to possessing the requisite tools for the job. It’s no coincidence that the New York Giants handed Brady two defeats in the Super Bowl with the same kind of team, and a very similar game plan. Simply put, you need to pressure Brady at an incredible rate and do so without resorting to the blitz, because Brady has been exceptional against the blitz throughout his career. The Giants pressured Brady in both of those Super Bowls on over 40 percent of his dropbacks, and did so while blitzing at under 20 percent of rushes across both games, 10 percent lower than the league average rate in 2017. In every other Super Bowl, Brady has been pressured under 40 percent of his dropbacks. Even last year’s game against Atlanta backs this theory, because at the point where the Falcons were 28-3 in front, they had put Brady under pressure on 44 percent of dropbacks, but they just ran out of gas over the second half and he ended up facing pressure on just 30 percent of dropbacks for the game. On one of Brady’s few comeback failures – the 2015 AFC championship game against the Denver Broncos, Denver was again able to put him under pressure at that kind of rate, hurrying him on 49.2 percent of his dropbacks, and holding the Patriots to just 18 points overall in the game. 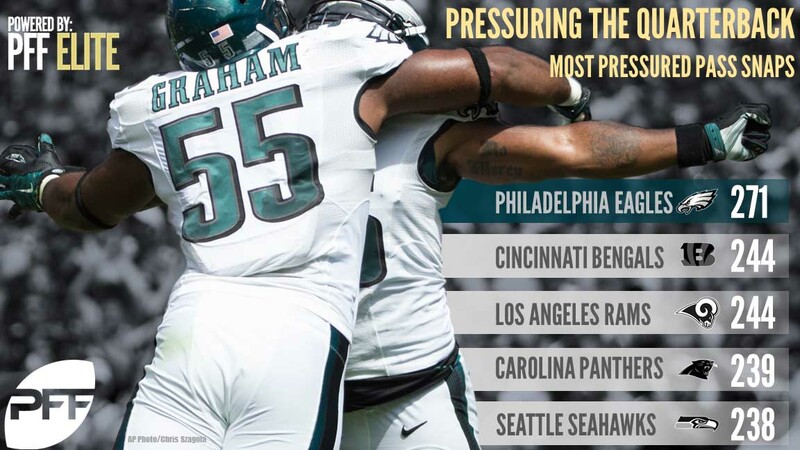 This Eagles team has been the best team in the league all year at generating pressure. They led the league with 271 pressures over the regular season, 27 more than the next-best team. They generated that pressure at a greater rate than anyone else, hurrying the opposing quarterback on average 41 percent of his dropbacks – right around that threshold for slowing Brady. What’s critical, is that they did this typically without blitzing. 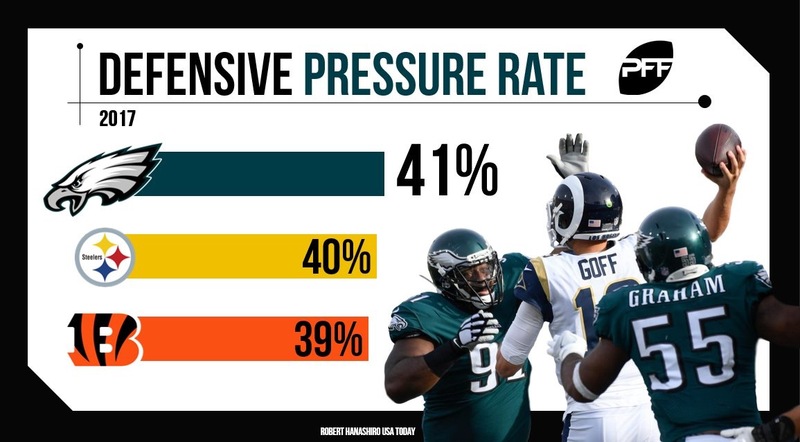 The Eagles had the 10th-lowest blitz rate in the league, but they generated pressure on 38 percent of their rushes featuring no blitz – again, the highest rate in the league. And why the Eagles might succeed where the Falcons came so close, is that Philadelphia’s defensive front is much deeper. They had seven players this season top 20 total pressures, which is one more than any other team in the league. While the Falcons’ pass-rush relied on a couple of stand out performers, the Eagles far more closely resemble those Giants’ defenses that could run four or more players deep along the defensive line when it comes to generating pressure. The Eagles are as well-equipped as anybody to slow Tom Brady and the Patriots offense down in the only way that has been repeatably successful over the years, but there is of course one caveat to that – it still may not be enough. Brady is just that good that he might beat that game plan anyway. He led the NFL this season in passer rating under pressure at 96.6. That’s almost 10.0 points higher than the average passer rating across all quarterbacks on all plays this year. Put another way, Brady under pressure this year had a passer rate 10.0 points higher than the average quarterback did on any given down, so as much as pressure is important, it’s really the volume of it and how decisive that pressure is – and the cumulative effect it could take over a game – that is more important. How effectively the Eagles are able to replicate that Giants’ game plan is going to determine whether they can keep Brady and that Patriots offense quiet enough to give themselves a chance.